Poseidon's Fury is a live theater show in The Lost Continent at Universal's Islands of Adventure. It's worth seeing on a time-permitting basis. Start by walking through the ruins of the ancient Temple of Poseidon, where you'll find an archeologist who will lead you deeper into the temple. But be careful. You might find that the legends of past are still very much alive. 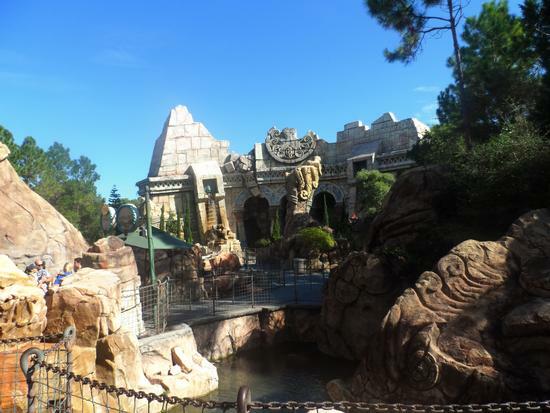 Poseidon's Fury features several special effects scenes, including a water vortex and a nifty effect that will have you questioning where you are. Or were. Usually lines are not long so not a bad stop, but it is really outdated compared to the rest of the park. The water Vortex is the highlight of this attraction. This has one of the great moments in theme park attractions... when the water vortex is working. But it desperately needs some animation improvements to regain its former glory. Still, worth seeing if you have the time and there's not much wait.